I wrote awhile back about how I felt that I might be going a little mad obsessing over my blood numbers and measuring my blood glucose and ketone levels. This is one of the greatest differences, in my opinion, between people that follow a ketogenic or low carb lifestyle for overall health reasons or weight loss, and those of us who are experimenting with using a ketogenic approach as a specific disease therapy. I’m using the term “therapeutic ketosis” now for this, as you’ll know if you’re a Constant Reader here at Greymadder. I think people in the first category, with weight loss or general health goals, can definitely be helped by measuring ketones, and that this is vital to the success of the approach. However, in my personal experience using this approach to “starve” my brain tumour, I find I can become quite the data junkie, measuring blood levels of both glucose and ketones up to four times a day, because in my mind, the optimal levels of both are perhaps what’s required to have a therapeutic effect. I base this on the book Cancer as a Metabolic Disease by Dr. Thomas Seyfried, in which he advises that there is a window of effectiveness of therapeutic ketosis for cancer that uses a glucose to ketone ratio of 1.0. This essentially means that when measured in mmol/L (“millimolar”), blood glucose and ketones should be equal, or even achieving ketone levels that are higher than the glucose levels may be preferable. There is general agreement between my favourite go-to references (Ellen Davis, Dominic D’Agostino, Miriam Kalamian, all found in my Resources section) that this glucose to ketone ratio of 1.0 is best. Miriam Kalamian, in her ebook Get Started with the Ketogenic Diet for Cancer further notes that it should not be disregarded that a therapeutic benefit could be attained with a glucose to ketone ratio of as much as 2.0. Okay, I hope I haven’t lost anyone yet. This sounds like geek speak, no? Let’s step through what that all means, briefly, in layperson’s terms, how about? The underlying theory here is that your cancer cells love sugar, they grow by feeding on sugar. Sugar in your body can be measured as blood glucose, similar to how diabetics measure their blood sugars, using a finger prick of blood. I wrote about this theory in a recent cross-post for the KetoDietApp blog, if you want to understand more about it. The idea behind eating for therapeutic ketosis is to reduce your blood sugar (glucose) and increase your ketones. The cells in your body can use ketones (they come from fat) for energy, but cancer cells don’t do this very well. So, the idea is to remove from your system the food your tumour likes best (glucose) and replace it with something that can keep the rest of your body running just fine, but your tumour cells don’t like (ketones). In order to do this successfully, you can see that you would want glucose as low as possible, and ketones as high as possible. That’s where the idea of a ratio comes in. A ratio is simply a neat mathematical way of using one number to show the relationship between two other numbers. This makes it easier for me to think about how I’m doing on my therapeutic ketosis goals, because I can look at that one number. You arrive at a ratio by dividing one number by another, in this case, we divide our glucose measurement by the ketone measurement. If the two measurements are the same, the answer equals 1.0. If ketones are higher, the answer will be below zero. If glucose is higher, the answer will be above 1.0. 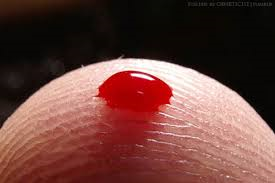 Let me show you, with some of my real blood readings, why this is important, and how it works. When I first started my therapeutic ketosis approach in March of 2013, I measured my blood numbers all the time, because I wanted to make sure I was successfully in ketosis. This was one of the first problems I encountered; I was sort of doing this the hard way, stitching together information I found that was mostly targeted toward weight loss. For that goal, all that’s really emphasized in most references, is measuring ketones alone, with the reference point that you can consider yourself in “nutritional ketosis” anywhere in the range of 0.5 mM and above. Most normal “sugar burners” on a traditional North American diet will have ketone blood levels below 0.5 mM. If you look at some recent ketone readings I took, you can see what I mean. In this first table, I’m showing blood ketone readings taken four times per day, over five days. It is well documented that ketone levels are usually lowest in the morning, and rise over the day. You can see that each day’s trendline shows this, with the exception of September 10th. I can tell you exactly what happened on September 10th. I ate a lunch and a supper that were both very high in protein, without enough fat. This resulted in low ketones later in the day on the 10th, and the morning of the 11th. The red horizontal line in the trend graphs is the 0.5 mM level, which we want to be above. You can see that almost every ketone measurement over these five days is in the “green”, above 0.5. This looks pretty good to me, if I was eating for nutritional ketosis, I’d be pretty happy about this. HOWEVER, if we add in the blood glucose measurements and look at the resulting ratio, you can see how I actually wasn’t meeting my goals on the 10th and 11th at all. Looking at this second table, which is the same data in the Ketone column, I’ve added in the glucose reading I got at that same time, and in the final column you see the glucose to ketone ratio (glucose divided by ketone). I’ve colored the “G:K” ratio column for my personal goals: green shows a ratio that is 2.0 or less; yellow shows a ratio 4.0 or less, and anything above 4.0 is RED. I arrived at these tolerances using the guidelines from Dr. Seyfried discussed above, modified for an allowable ratio up to 2.0. I do this, because I’ve found that even eating very strictly, I can only rarely achieve a ratio near 1.0, and I’m looking to arrive at a nutritional approach that I can use for the rest of my life. So I give myself up to a ratio of 2.0. I throw a caution flag between 2.0 and 4.0, for no reason other than that when I see this, I can buckle down! You can see in the second table that what was actually happening on September 10th was pretty high blood glucose readings, which is why my ketones were down, and which jumped after lunch and supper, which I know were high in protein. This is precisely why ketogenic diet resources will tell you to limit protein to moderate intake – too much, and it is converted to blood glucose. You can see why measuring these levels would have scared me on the 10th, and how that affected my behaviour on the following days, resulting in a correction that saw pretty optimal levels by the end of the day on the 11th. I hope you can see from this example why, when following this lifestyle for therapeutic reasons for cancer, it’s important to measure and compare glucose to ketones, and really work to maintain the recommended therapeutic range. If you read some of the published studies from Dr. Seyfried and Dr. D’Agostino, you’ll see that they are working on the idea of combining this kind of therapeutic ketosis with other supplements that challenge cancer cell metabolism. They postulate that to really kill a tumour, a therapeutic diet that limits calorie intake, achieves that 1.0 or even a less than zero glucose to ketone ratio, and involves some complementary metabolic therapies may be required. Out here in the Canadian prairies, doing my own experiment on me, I’m working on achieving a good glucose to ketone ratio that I can sustain in a lifestyle for decades, in a happy and productive life. If my tumour never really starves to death, but just sits stagnant, I’m okay with that. Before you ask, no, I don’t measure these levels four times daily, every day all the time. I go for a month at a time not measuring at all, to be honest, which I consider a little “off the wagon”. Ideally, I like to measure once or twice daily a couple of times a week to make sure I’m on track. If I see a day like the 10th, I go into full-on measurement attack mode, and am pleased every time to see my metabolism respond. I use an Abbot Labs Precision X-tra blood meter, and order measurement sticks online. The glucose sticks cost about $75 for a box of 100, and the ketone strips cost $25 for a box of 12. Since this is a post about math, you can do the calculations to see what this little data jaunt cost, and why you might not want to measure every day all the time like I did in this example. There are also other means of measuring ketones, of course, which you can find many good reviews for online, including urine sticks and a recent innovation, a breath analyzer. These have advantages in cost, but do not provide actual numbers that you can use to calculate a ratio, so if you’re into the solid data like me, blood measurements are necessary. Please see my Resources page for the books and links to experts I’ve discussed here. Thanks for that excellent helpful coverage of glucose & ketones. HI Gm, I am doing the blood glucose/ketone testing with strips like you (but once/day every 2 days) and have been living with the ketogenic diet full on since Feb14, I found I couldn’t get my blood sugars to go lower than around 4.5 mmol (was trying to get down to Dr Seifreid’s recommended 3.6, or at least under 4) after starting the intermittent fasting they really stabilised. I finish eating by 5 or 6pm then don’t start again until 10/11am the next day. I am happy that you get good results with a ratio of up to 2 as I get a bit stressed when mine start edging up past 1.3, I also find that red meat makes my blood sugars spike. Its early days for me yet am just coming up to 1 year past chemo but my last 2 cancer blood tests were down which is where I want them to be, heres hoping for more down results as then I will know this is working for me. Hi, Lynn, thanks for reading and for sharing your experiences, I really think that there are actually enough people out there using this approach, that if we could just all get together and share our strategies, we could make a difference for others! Have you thought about using a low dose of Glumetza (time released metformin) to help suppress glucose levels? Gerard, you read my mind! Yes, I’ve thought a lot about this. I’m still working to find a doctor that wants to enter into this experiment with me. And I’m thinking about timeframes, how long to use this, whether to include exogenous ketone supplements as well, again, for how long? Experimental design! Patrick Arnold (the guy who formulated one of the products used, KetoForce), remarked in the comments that he’s working on a formulation that addresses the taste and pH issues. Whether or not you can get any exogenous ketone products in Canada is not known to me. Hi, Boundless. Yes, I follow this blog, and I’m not sure what the deal is with ordering something like KetoForce and having it shipped across the border, but I did it and it arrived. I’ve tried it out in a number of ways; they suggest using up to 3 capfuls prior to a workout, it’s designed as a quick energy boost for athletes, and they say it will be metabolized within an hour or two. I have confirmed this on my blood readings, and have also tried a lower dose, up to three times per day, but don’t see a real boost in ketone levels that way. I think it’s a transient effect, but that’s not to say it’s not putting metabolic pressure on the tumour. And thanks for that link – that’s actually about me! Rather than glumetza or metformin, you could consider natural berberine herb – studies have shown it works as well as metformin but has other benefits, and no negative side effects. It seems to work in place of insulin at clearing sugar. There is always going to be some sugar in your body from protein metabolism. Your story here is amazing and I really wish you success in healing yourself and inspiring others. Thanks for this suggestion, I will definitely investigate! Hello there, I am wondering if you have tried herbs or green tea extract to reduce insulin. I al also in Canada and finding or getting a prescription for metformin is unlikely. The above article was very helpful to me. Hi, Susan, I know how you feel in terms of wanting some help with blood sugar targets. In short, no, I haven’t really tried supplements or herbs. To be honest, I’m skeptical that these will make a great deal of difference, but I’m a skeptic by nature! I was tempted to look for prescription or other solutions, but in the end, I’m trying to find a dietary approach that I think I can live with the rest of my life, and I didn’t want that to include drugs or other interventions if it didn’t have to. So I’ve accepted that for me, if I’m sitting around 2.0 instead of 1.0, or even a little higher, well, this is all early days of research, those numbers are based on rodent experiments, and I believe what I’m doing is beneficial in any case, so I try to get as low as I reasonably can on blood sugar, and as high as I can on ketones, and then cut myself a break! It discusses GK ratio, and also introduces the notion of multi-day water fasts. Seyfried doesn’t seem keen on intermittent fasting, but it’s not clear he’s assuming a typical glycemic diet, or a keto diet. I would expect IF to be relatively ineffective for someone on a consensus diet. I am trying to find out the optimal amount/times to measure my blood glucose and ketone levels on a ketogenic diet. Do you recommend to do so each morning and after each meal? Thanks. I want to thank you for the G&K values… The good work, since I was looking for good information for some time. I lower my protein to 30 to 60 grams per day and carbs 5 grams and the rest consists of all butter. I just can’t lower my glucoselevel to fours… I keep staying around 5,9 – 5,6… eventhough I am in my 6th week of ketosis. My ketone level is 1.5… I want to get better results and I need some help. Some advice would help. Thank you all the way from Holland and Wish All The Best. You are strong and Stay Strong. Ertugrul. Is there a XLS or app ready made for entering glucose and ketone data to show the ratios and graphs? …just scroll down to the bottom and the file is attached. Does anyone know what the danger zone for too low of blood sugar would be for a healthy individual? I’m going to do a 5-day water fast & will be monitoring glucose & ketones, I’m wondering is there a lower limit that I should watch for relating to glucose level? The ratio should be Ketones:Glucose > 1 That way Ketones are higher than Glucose. You have the ratio the wrong way around. Thank goodness you replied. I was wrong, and the ratio is indeed glucose:ketone. Please excuse me. Menopause. Aging? Smartarse? I’ve seen information about the GKI and therapeutic levels, but no where have I seen anything about how long one should maintain therapeutic GKI levels. Given that GKI <1 usually requires fasting to obtain, it would be helpful to know how long to fast for. Any thoughts? Very simple, straightforward and informative study. Keep up your good work, many shall benefit from these ! ← Does working to improve your health make you judgemental?